Hi loves ! Today I styled my Nine West ‘Elodia’ wedges via Rack Room Shoes for date night! There may not be many more date nights in our future for a while, so we got all dressed up and went to The Cheesecake Factory for an early dinner yesterday. I chose to style this fabulous Pink Blush Maternity dress with the glitter belt from Target to cinch my growing waistline! I love these wedges because they’re neutral and go with pretty much any outfit! This season, wedges, floral patterns, bright colors, boat shoes, embellished sandals, and casual comfy shoes are going to be super popular! Oh, and just so you know, Rack Room Shoes is known for it’s every day “Buy One Get One 50% off” promotion on all styles, and with the Rack Room Rewards program, you can use lots of perks like discounts, coupons, and $15 in rewards for every $200 you spend! There’s lots of fabulous brands sold, so be sure to check them out! The Loren Hope bracelet was in my Rocksbox package this month, and it’s one of my favorite pieces of jewelry! Have you ever heard of Rocksbox? It’s an amazing jewelry service that allows you to pick your favorite pieces each month! Your stylist then puts together a special box just for you so you can style the jewelry on loan and purchase them if you like, then when you’re ready for new pieces simply send it back! Want to try it FREE for a month? Use the code livingincolorxoxo at checkout! *This post is sponsored by Rack Room Shoes and Rocksbox, however all opinions, photos, and content are my own! Such a cute and springy outfit! You look gorgeous and I absolutely love those shoes!! I love your pregnancy style – you always look so adorable! Definitely take advantage of those date nights now girly! perfect for Spring! Loving your Rocksbox pieces too! 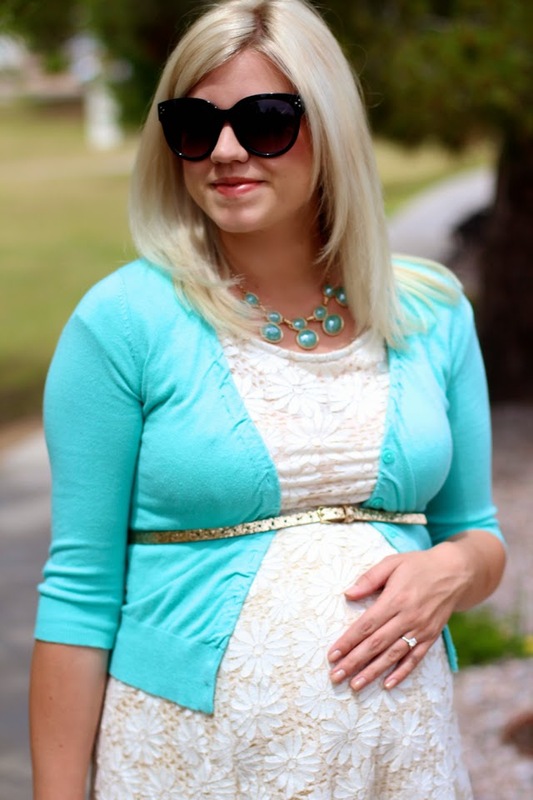 You look amazing in this look – that blue cardigan is really cute! 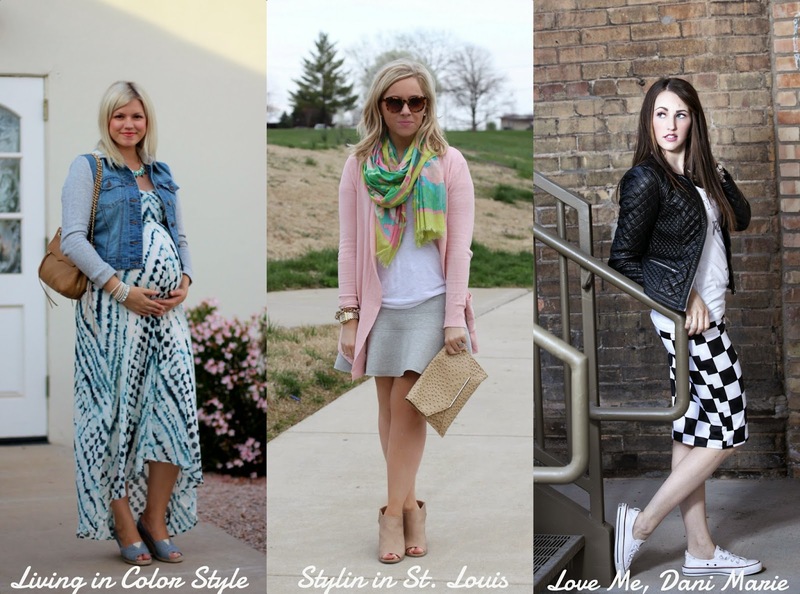 Loving your maternity style!